It has been over ten years since the International Human Dimensions Programme on Global Environmental Change (IHDP) convened a scoping meeting to discuss the idea of creating a new international science project on cities and urbanization. At that time, the science of urbanization and global change was just emerging, and IHDP recognized an opportunity to develop a new science project that would frame, catalyze, and coordinate research in this area. Over three years, a Science Plan was written, reviewed and published, a Scientific Steering Committee (SSC) appointed and convened, an International Project Office (IPO) inaugurated and staffed, and the Urbanization and Global Environmental Change Project, or UGEC, officially launched in 2006. UGEC is now a vibrant international network of scholars and practitioners working at the intersection of urbanization and global environmental change. We have significantly improved and expanded knowledge of the key role of these interactions to better understand the dynamic and complex challenges our societies face in the 21st century. Many in our network have been instrumental in shaping domestic and international policy and science agendas, from the IPCC 5th Assessment Report to a standalone Urban Sustainable Development Goal. New areas of research have emerged and today, this community of scholars extends well beyond the original international science project. We should be proud of the role the UGEC community has played in these contributions. We want to first thank all of you for your support and engagement in UGEC research and activities over the last decade. It has been a pleasure to be part of this shared learning experience. We are currently exploring alternatives to keep our network functioning, and to transition into a new phase. UGEC SSC member Patricia Romero-Lankao is leading this transition and we will keep you informed of possible future activities. After January, the UGEC website (ugec.org) will remain active, but will no longer updated with new material. Additionally, we are exploring ways in which we can continue the UGEC Viewpoints blog as it has been such a wonderful venue for showcasing the work of this community. We are also happy to report that Corrie Griffith, Executive Officer, and Mark Watkins, Project Coordinator, are both transitioning into new positions within the Global Institute of Sustainability at ASU. Mark is now Program Manager for the Central Arizona–Phoenix Long-Term Ecological Research Project and Corrie will be working as Program Manager with the Global Consortium for Sustainability Outcomes. Their email addresses will remain the same. While we are disappointed to see them leave our wonderful project, we are happy they have secured their affiliation with ASU and wish them success in these new opportunities. Thank you for all your efforts and friendship over the last decade. We wish you all the best in your future endeavors and hope our paths cross again in the near future. This entry was posted in blog and tagged Karen Seto, roberto sanchez rodriguez, ugec on January 18, 2017 by Mark. 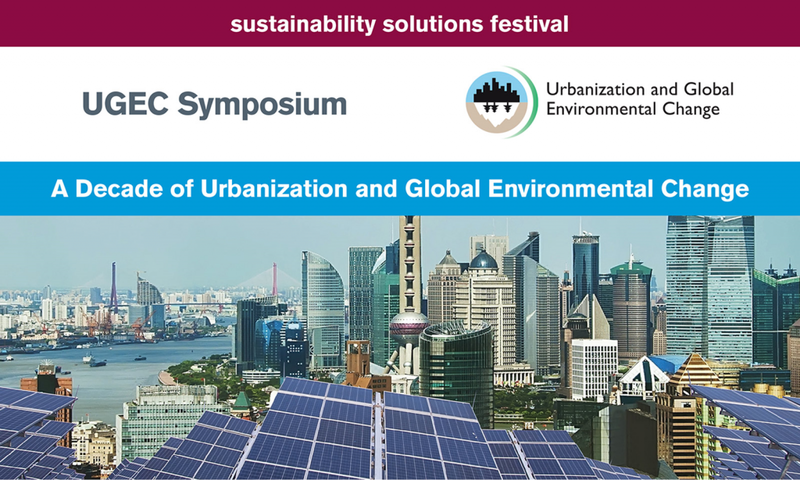 The UGEC Symposium: A Decade of Urbanization and Global Environmental Change is now on YouTube! Recorded and edited by Mark Ahn Creative Services. 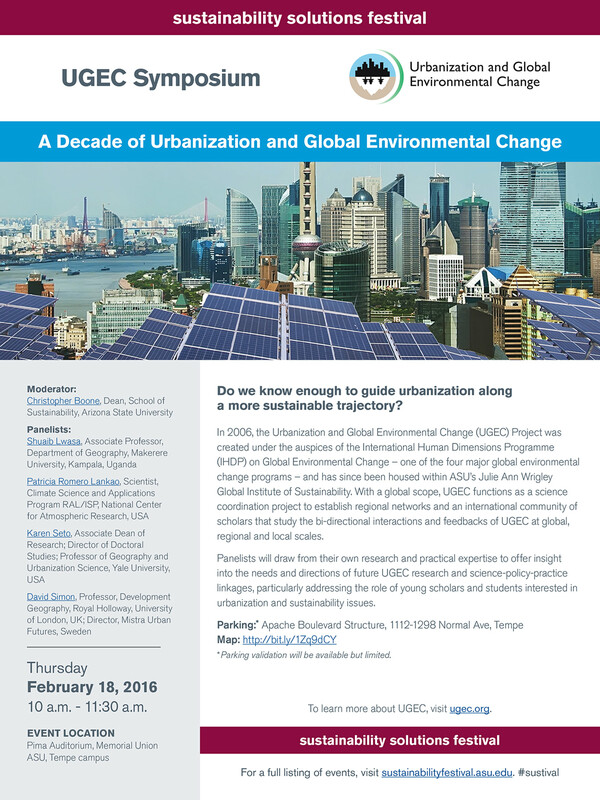 The Urbanization and Global Environmental Change Project is proud to announce “A Decade of Urbanization and Global Environmental Change: A UGEC Symposium” on Thursday, February 18, 2016 at the Arizona State University Memorial Union in the Pima Auditorium. The event starts at 10:00. 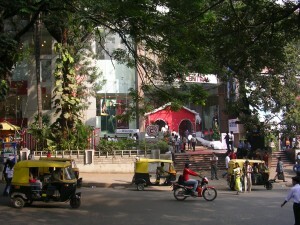 It is part of the Sustainability Solutions Festival. Panelists will draw from their own research and practical expertise to offer insight into the needs and directions of future UGEC research and science-policy-practice linkages, particularly addressing the role of young scholars and students interested in urbanization and sustainability issues. Click the image for more details, or click here to download the pdf version. This entry was posted in blog and tagged Arizona State University, Christopher Boone, david simon, global environmental change, Julie Ann Wrigley Global Institute of Sustainability, Karen Seto, Patricia Romero Lankao, Shuaib Lwasa, Sustainability Solutions Festival, ugec, ugec symposium, urbanization on January 29, 2016 by Mark. 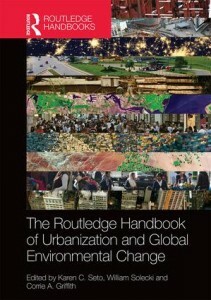 The Routledge Handbook of Urbanization and Global Environmental Change is out now! This entry was posted in blog and tagged Corrie Griffith, global environmental change, Handbook, Karen Seto, Routledge, ugec, urbanization, William Solecki on January 11, 2016 by Mark. Members of the Urbanization and Global Environmental Change Project network have contributed comments to the Habitat III Issue papers. 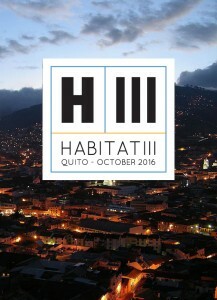 The Habitat III Issue Papers are summary documents that address one or more research areas, highlight general findings, and identify research needs on topics related to housing and sustainable urban development. They are meant to provide in depth review and analysis of specific issues relevant to the discussions of the Habitat III Conference, to be held October 17 – 20, 2016 in Quito, Ecuador. Many thanks to everyone who volunteered their time and efforts in putting this document together. This entry was posted in blog and tagged Habitat III, Habitat III Issue Papers, ugec, un habitat on November 17, 2015 by Mark. The Urbanization and Global Environmental Change (UGEC) Project is currently in a synthesis phase, reflecting on the last ten years since the project began in 2006. As part of these efforts, we have put together this survey to better understand UGEC’s contribution to and broader impacts on research and practice communities worldwide. We anticipate that it will take 30 minutes of your time to complete. Although you are by no means obligated to answer ever question, the more you complete will be of great benefit to us. Your responses will inform future research directions and operations of the project moving forward into the next phase. This entry was posted in blog and tagged survey, ugec on October 6, 2015 by Mark.